Saint Alphonsus Liguori CSsR (1696–1787), sometimes called Alphonsus Maria Liguori, was an Italian Catholic bishop, spiritual writer, composer, musician, artist, poet, lawyer, scholastic philosopher, and theologian. He was born in Marianella, near Naples, then part of the Kingdom of Naples, on 27 September 1696. He was the eldest of eight children of Giuseppe Liguori and Anna Maria Caterina Cavalieri. Two days after he was born, he was baptized at the Church of Our Lady the Virgin as Alphonsus Mary Anthony John Cosmas Damian Michael Gaspard de' Liguori. The family was of noble and ancient lineage, but the branch to which the Saint belonged had become somewhat impoverished. Alphonsus's father, Don Joseph de' Liguori, was a naval officer and Captain of the Royal Galleys. Liguori learned to ride and fence but was never a good shot because of poor eyesight. Myopia and chronic asthma precluded a military career so his father had him educated for the legal profession. He was taught by tutors before entering the University of Naples, where he graduated with doctorates in civil and canon law at 16. He remarked later that he was so small at the time that he was almost buried in his doctor's gown and that all the spectators laughed. When he was 18, like many other nobles, he joined the Confraternity of Our Lady of Mercy with whom he assisted in the care of the sick at the hospital for "incurables". He became a successful lawyer. He was thinking of leaving the profession and wrote to someone, "My friend, our profession is too full of difficulties and dangers; we lead an unhappy life and run risk of dying an unhappy death". At 27, after having lost an important case, the first he had lost in eight years of practicing law, he made a firm resolution to leave the profession of law. Moreover, he heard an interior voice saying: "Leave the world, and give yourself to me." In 1723, he decided to offer himself as a novice to the Oratory of St. Philip Neri with the intention of becoming a priest. His father opposed the plan, but after two months (and with his Oratorian confessor's permission), he and his father compromised: he would study for the priesthood but not as an Oratorian and live at home. He was ordained on 21 December 1726, at 30. He lived his first years as a priest with the homeless and the marginalized youth of Naples. He became very popular because of his plain and simple preaching. He said: "I have never preached a sermon which the poorest old woman in the congregation could not understand". He founded the Evening Chapels, which were managed by the young people themselves. The chapels were centers of prayer and piety, preaching, community, social activities and education. At the time of his death, there were 72, with over 10,000 active participants. His sermons were very effective at converting those who had been alienated from their faith. Liguori suffered from scruples much of his adult life and felt guilty about the most minor issues relating to sin. Moreover, the saint viewed scruples as a blessing at times and wrote: "Scruples are useful in the beginning of conversion.... they cleanse the soul, and at the same time make it careful". On 9 November 1732, he founded the Congregation of the Most Holy Redeemer, when Sister Maria Celeste Crostarosa told him that it had been revealed to her that he was the one that God had chosen to found the congregation. He founded the congregation with the charism of preaching popular missions in the city and the countryside. Its goal was to teach and preach in the slums of cities and other poor places. They also fought Jansenism, a heresy that supported a very strict morality: "the penitents should be treated as souls to be saved rather than as criminals to be punished". He is said never to have refused absolution to a penitent. A gifted musician and composer, he wrote many popular hymns and taught them to the people in parish missions. In 1732, while he was staying at the Convent of the Consolation, one of his order's houses in the small city of Deliceto in the province of Foggia in Southeastern Italy, Liguori wrote the Italian carol "Tu scendi dalle stelle" ("From Starry Skies Descending") in the musical style of a pastorale. The version with Italian lyrics was based on his original song written in Neapolitan, which began Quanno nascette Ninno (When the child was born). As it was traditionally associated with the zampogna, or large-format Italian bagpipe, it became known as Canzone d'i zampognari the ("Carol of the Bagpipers"). Alphonsus was consecrated Bishop of Sant'Agata dei Goti in 1762. He tried to refuse the appointment by using his age and infirmities as arguments against his consecration. He wrote sermons, books, and articles to encourage devotion to the Blessed Sacrament and the Blessed Virgin Mary. He first addressed ecclesiastical abuses in the diocese, reformed the seminary and spiritually rehabilitated the clergy and faithful. He suspended those priests who celebrated Mass in less than 15 minutes and sold his carriage and episcopal ring to give the money to the poor. In the last years of his life, he suffered a painful sickness and a bitter persecution from his fellow priests, who dismissed him from the Congregation that he had founded. Alphonsus was a prolific and popular author. He was proficient in the arts, his parents having had him trained by various masters, and he was a musician, painter, poet and author at the same time. Alphonsus wrote 111 works on spirituality and theology. The 21,500 editions and the translations into 72 languages that his works have undergone attest to the fact that he is one of the most widely-read Catholic authors. Alphonsus' greatest contribution to the Church was in the area of moral theology. His masterpiece was The Moral Theology (1748), which was approved by the Pope himself and was born of Alphonsus' pastoral experience, his ability to respond to the practical questions posed by the faithful and his contact with their everyday problems. He opposed sterile legalism and strict rigorism. According to him, those were paths closed to the Gospel because "such rigor has never been taught nor practiced by the Church". His system of moral theology is noted for its prudence, avoiding both laxism and excessive rigor. He is credited with the position of Aequiprobabilism, which avoided Jansenist rigorism as well as laxism and simple probabilism. Since its publication it has remained in Latin, often in 10 volumes or in the combined 4-volume version of Gaudé. It saw only recently its first publication in translation, in an English translation made by Ryan Grant and published in 2017 by Mediatrix Press. The English translation of the work is projected to be around 5 volumes. ^ a b c Castle, Harold (2007). "St. Alphonsus Liguori". The Catholic Encyclopedia. New Advent. Archived from the original on 5 July 2007. Retrieved 9 August 2007. ^ a b c d e f Fr. Paolo O. Pirlo, SHMI (1997). 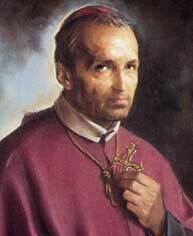 "St. Alphonsus Liguori". My First Book of Saints. Sons of Holy Mary Immaculate – Quality Catholic Publications. pp. 166–167. ISBN 971-91595-4-5. ^ "Carol of the Bagpipers". The Hymns and Carols of Christmas. Retrieved 11 December 2014. ^ "1st English Translation of St. Alphonsus Liguori's Moral Theology". Mediatrix Press. ^ P Hitz, Alfons v. Liguori, Paterborn 1967, p. 130. Wikimedia Commons has media related to Alphonsus Maria de Liguori. Wikisource has the text of the 1911 Encyclopædia Britannica article Liguori, Alfonso Maria dei. This page was last edited on 26 February 2019, at 19:56 (UTC).